Thousands of private companies go bankrupt every year. It’s important to identify those risky companies before they file, particularly if they are your largest customers or suppliers. Without financial statements on private companies, most people rely on payment behavior but that can be challenging to analyze. As an existing or prospective supplier to or purchaser from a private company, you should know the company’s credit history, especially if it is experiencing financial difficulty. Why? That company could be on the brink of bankruptcy. Therefore, you should have the best resources available to help perform your job as a risk professional. 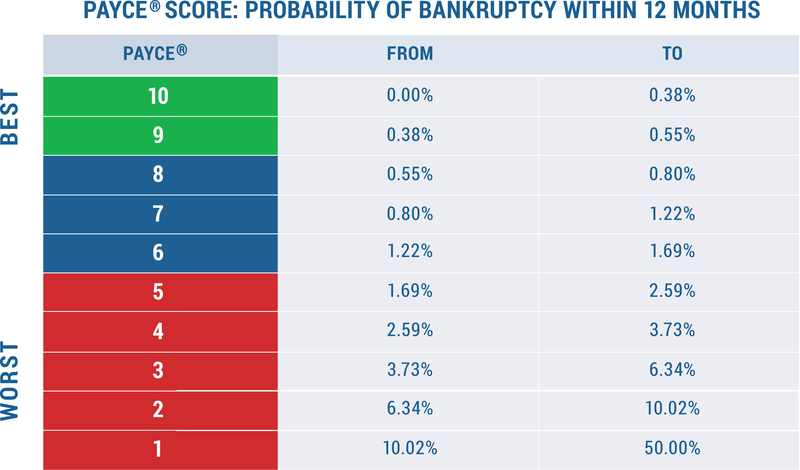 CreditRiskMonitor's proprietary PAYCE® score provides high accuracy, predicting 70% of private company bankruptcies, and excellent timing as it looks out 12 months. Taking a step back, CreditRiskMonitor’s own Days Beyond Terms or DBT Index tells whether a company has been paying its invoices on time. The DBT Index is a measurement of historical payment performance, expressed as the average number of days by which a subject company’s payments are past due. Effectively, it is a backward-looking dollar-weighted measurement of past payment performance, converted into a simple range labeled from "1" (worst) to "10" (best). Anything between a score of “1” and “5” is known as the “red zone,” a high risk category that should be given immediate attention. As an additional risk precaution, the PAYCE® score can also be compared to the ratings of other credit reporting agencies. An agreement between other ratings and the PAYCE® score will provide confirmation as to whether a given private company is risky or not, whereas a disagreement may require further investigation. In a previous report, we detailed three private companies that filed for bankruptcy in early 2018. In those instances, the PAYCE® score was highly effective. Below we evaluate three more operators that filed for bankruptcy in mid-late 2018, all operating in the retail industry. NSC Wholesale Holdings, LLC has several locations in the Northeast of the U.S. Over the past year, the DBT Index indicated some slow payment behavior. Meanwhile, the PAYCE® score steadily forewarned of high financial risk, with the score never rising above a "3." In October of 2018, the business filed for bankruptcy in the District of Delaware. Had suppliers relied on the PAYCE® score, they would have been aware of the company’s steady risk of bankruptcy. National Stores, Inc. was established in 1964 and expanded throughout the U.S. Although the DBT Index showed somewhat timely payment behavior, the PAYCE® score had warned of financial trouble for many months prior to the company's filing in August of 2018. Using the PAYCE® score score would have provided suppliers an opportunity to adjust payment terms. Gump’s Holdings, LLC was established more than 150 years ago and operates on the West Coast of the U.S. The DBT Index showed deteriorating payment behavior historically. The PAYCE® score fell to the worst risk category of “1” and remained there for several months. Simply put, the PAYCE® score was indicating serious danger and by August of 2018, the company had filed for bankruptcy. CreditRiskMonitor offers PAYCE® score coverage on more than 80,000 of the largest U.S. private companies and this figure continues to grow rapidly. This proprietary model uses artificial intelligence and ultimately signals bankruptcy risk well in advance of the actual filing. In the three company examples shown above, the DBT displayed historical payment behavior whereas the PAYCE® score displayed elevated risk of bankruptcy prior to each filing. Simply put, if you cannot source financial statements on your private company counterparts, the PAYCE® score will be one of your next best options. This solution will help you mitigate financial loss from private companies.